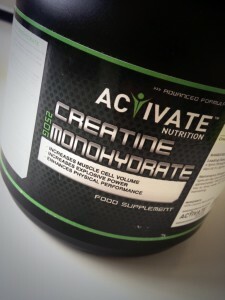 Activate Nutritions’ Creatine Monohydrate Powder – A great supplement! So, after all my research I added one supplement to my daily diet – Creatine Monohydrate. Why Creatine Monohydrate you ask..? Creatine is required for energy generation by the muscles in the first energy system; the Phosphocreatine energy system, known as ATP-PCr. ATP-PCr is an anaerobic energy system in which the generation of ATP is coupled with the exergonic (energy-releasing) breakdown of phosphocreatine. This breakdown frees inorganic phosphate, which then combines with ADP to form ATP. Athletes in power events lasting up to 10 seconds e.g. 100m sprints and powerlifting, derive most of their ATP from this system¹. It has been scientifically proven that supplementing with creatine can extend the duration of your ATP-PCr energy system by 5 to 15%². This means that you could go from 8 reps to 10 reps – meaning you are able to work out longer and / or harder; speeding up your strength and metabolic conditioning gains. I’ve been using Activate Nutritions’ Creatine Monohydrate Powder for a couple of months now, and can’t recommend it more highly. In the time I’ve been taking their supplement I’ve put in quite a few powerlifting PBs and have noticed an increase in power during CrossFit training. Also the Activate Nutrition Creatine powder mixes up in smoothies and protein shakes extremely well – a must in my book! Activate Nutrition supplements are UK made and of very high quality, as you know I don’t tell you to put rubbish in your body, so you can rest assured this is a great product! This entry was posted in Paleo & Nutrition and tagged Metcon, Muscle Gain, Paleo, Strength, Supplementation, Training. Bookmark the permalink.